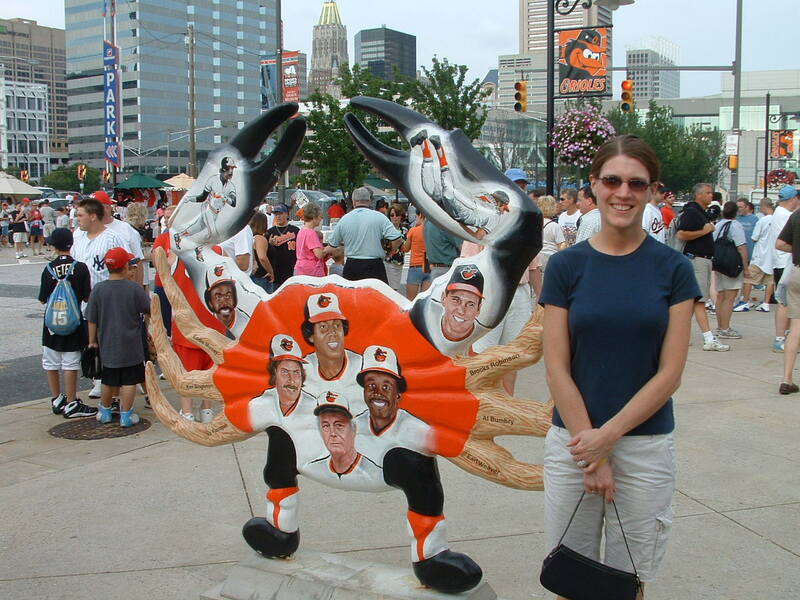 This was part of my birthday present in 2005 - a trip to see the Baltimore Orioles play at Camden Yards! In CLUB SEATS none the less! (Isn't she great? :-) ). We headed out of Binghamton on Saturday morning, making the drive straight through to Baltimore. Pulled into Baltimore around 2:00 and went to the Lexington Market. Same idea as the Reading Terminal Market, or Pikes Place Market, but not even close to being as nice. Mostly prepared food vendors, and not as large as other markets we had been to, so it only took us about a half hour to browse through. Left Lexington Market and went down to the Inner Harbor for some shopping. It was VERY crowded down there. Shopped around, and then headed to the world famous Obrycki's for dinner. Great seafood! Started out with spicy shrimp cocktail, and then Jill had a broiled crabcake and I had a sampler which included crabcake, deviled crab, breaded shrimp, breaded fish, and veggies. After dinner, we went to our hotel - the Hilton Garden Inn in Columbia, Maryland. Newer hotel, very thin floors and walls. Actually sounded like someone was shouting through the vent at one point! Went out to Arundel Mills and hung at Jillian's Saturday night. On Sunday, we had breakfast at the hotel (not very good) and then over to Arundel Mills for some shopping. Had lunch at Chevy's Mexican Grill. Then went to Baltimore for the game. Went back over to Inner Harbor for a little bit before heading into the game. Had tickets in the club seats, section 220 - even with first base. Game time was originally 1:30, but time was moved to 8:00 so it could be shown on 'ESPN Sunday Night Baseball'. 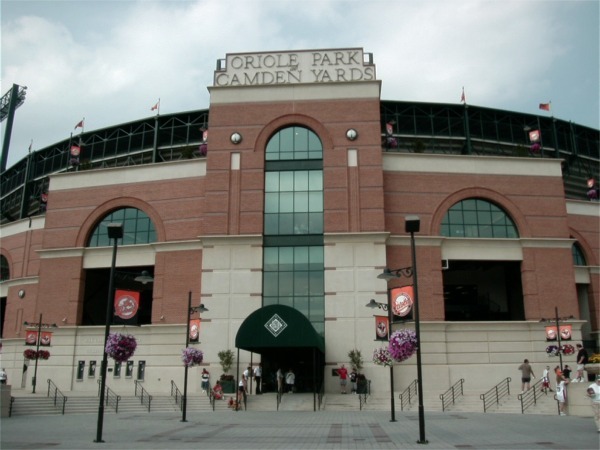 Camden actually didn't float to the top of our 'favorite' list (Philly's Citizens Bank Park still holds that distinction). A nice stadium, but it somehow lacked the atmosphere that we have seen at other stadiums. And, it was dirty - something that one would not expect from a stadium that gets such rave reviews across the board. Game itself was horrible for Orioles fans - five runs in the first by the White Sox set the tone for the rest of the game. We left at the end of the seventh and began the drive home. Finally pulled into the driveway at 3:30 in the morning. Tim with his waiter delivered crab cake sammy! Orioles go down early vs. Sox Lopez allows eight runs over 1 1/3 innings in loss By Jeff Seidel / Special to MLB.com BALTIMORE -- Rodrigo Lopez wanted to go deep into Sunday night's game against the Chicago White Sox to give the Baltimore bullpen the rest it so badly needed. But Lopez just found more problems as the Orioles finished off a frustrating month with a frustrating game. Lopez needed 44 pitches and about 25 minutes to get through the top of the first inning on Sunday night. The right-hander allowed five runs on four hits in the opening frame, and the Orioles fell to their fifth straight loss as the Chicago White Sox rolled to a 9-4 victory. The Orioles now have lost 13 of their last 15 games and finished July with an 8-18 record. Chicago battered Lopez (9-6) from the start. He allowed eight runs -- all earned -- on seven hits in 1 1/3 innings as the White Sox hit line drives all over the park before Todd Williams relieved him. "[It was] one of my worst starts of my career," Lopez said. "I feel really good during the bullpen. The last thing I wanted is to go 1 1/3. You're even more frustrated when you feel you let your team down. I feel like I had good stuff." Baltimore manager Lee Mazzilli said Lopez might have pressed too hard to pitch too well, knowing how much the bullpen needed some kind of break. 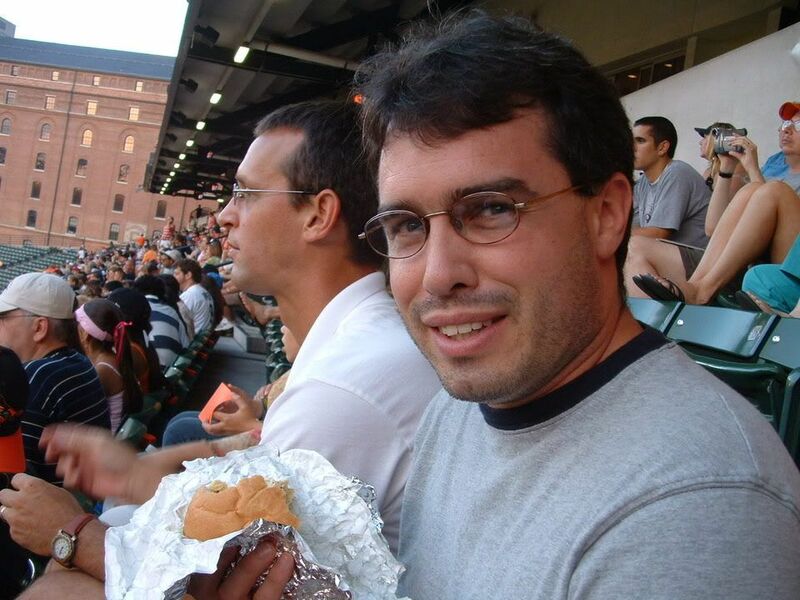 "I think he was well aware of his surroundings," Mazzilli said. "He was really trying to think that he could go the distance right away. It's tough to pitch that way. It seemed like every pitch he threw, he wanted to make it through the inning. He was just trying too hard." The White Sox sent 10 batters to the plate in the first inning alone. Jermaine Dye gave the White Sox the lead with a two-run single, and Joe Crede followed with a two-run double before Juan Uribe later added an RBI single for the 5-0 lead. Paul Konerko (double), Aaron Rowand (single) and Dye (single) got consecutive run-scoring hits in the second. Dye's hit ended Lopez's night and gave the White Sox an 8-1 lead. The Orioles' already over-tired bullpen got pushed even more, needing to contribute 7 2/3 innings on Sunday after throwing 7 1/3 innings on Saturday, when starter Daniel Cabrera needed to leave after being hit by a Crede grounder. Bruce Chen was supposed to start in Monday's series finale, but he had to come on in relief for the second straight game. Chen entered and threw 3 2/3 scoreless innings, giving up just two hits and knowing he'd lose his starting role this time around. "It has been a tough time for the bullpen," Chen said. "I just wanted to help the team in whatever way I could. The bullpen has done a great job for us, and they were tired." The O's bullpen gave up one run on six hits in 7 2/3 innings on Sunday. Todd Williams, Chen and then Tim Byrdak combined to strike out six and walk only two. "I think everyone has a good attitude, and hopefully things will start changing around," Williams said. "We're getting through it." Chicago manager Ozzie Guillen wasn't happy with how Williams got through the third inning, specifically when the right-hander hit Tadahito Iguchi on the hip. Iguchi suffered a left hip contusion and had to come out. "Good pitchers win games, [bad] pitchers hit people," Guillen said. "I think that's the weakest [stuff] I've ever seen because if you can't people out of here, then get another job." Cabrera now will start Monday afternoon's game. Mazzilli said Sidney Ponson and Erik Bedard are set to pitch the first two games of the West Coast series against the Los Angeles Angels of Anaheim. The highlight of this game came when Brian Roberts and Eric Byrnes hit back-to-back solo homers to lead off the seventh against Chicago starter Freddy Garcia (11-4). This was Roberts' first home run since July 4 against the Yankees. Byrnes went 3-for-5 and now is 4-for-10 in his first two games with the Orioles. The Orioles once again found problems coming up with clutch hits. They finished the night with 12 base hits but left 12 on base, wasting several chances throughout the game to pull closer. The loss dropped the Orioles (51-53) to two games under .500 for the first time this season as they've also gone 1-8-2 in their last 11 series. Jeff Seidel is a contributor to MLB.com. This story was not subject to the approval of Major League Baseball or its clubs.